Oddly enough, I rediscovered my old Tarot deck today -- I hadn't touched it in almost 5 years. It still amazes me how intuitive it is. A Malaysian man was charged with hacking into the computer network of the U.S. Federal Reserve Bank and possessing more than 400,000 stolen credit cards and debit cards, U.S. prosecutors said Thursday. The man, identified as Lin Mun Poo by prosecutors in New York City's borough of Brooklyn, was arrested on Oct. 21 hours after his arrival in the United States and is being held pending his case before a federal judge. "The defendant made a career of compromising computer servers belonging to financial institutions, defense contractors, and major corporations, among others, and selling or trading the information contained therein for exploitation by others," Loretta Lynch, the U.S. Attorney in Brooklyn, said in a statement. The statement said he planned to obtain more stolen financial account information from other hackers, which he planned to use and sell. U.S. Secret Service agents seized his encrypted laptop computer. 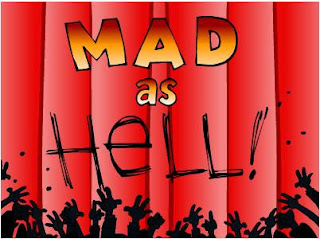 Mark Fiore: Mad as Hell! The extradition of alleged Russian arms trafficker Viktor Bout from Thailand to the United States on Tuesday drew sharp protests from Russian officials, who insist the so-called merchant of death is an innocent businessman. Bout, a former Soviet air force officer who reportedly maintains strong ties to Russian intelligence, had been put aboard a chartered a plane under tight security in Bangkok and arrived in suburban New York in manacles late Tuesday. He faces four federal terrorism charges, U.S. officials said. Bout is scheduled to appear before a federal judge in the Southern District of New York on Wednesday. According to an indictment unsealed in May 2008, three of the counts carry a maximum life sentence and the fourth a prison term of up to 15 years. Bout, 43, reputed to be one of the world's most prolific arms dealers, was arrested in March 2008 in Bangkok as part of a U.S.-Thai sting operation in which agents posed as arms buyers for the rebel group the Revolutionary Armed Forces of Colombia. 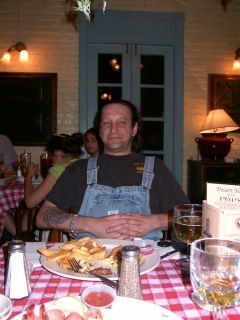 While held in a maximum-security prison in Thailand, Bout fought extradition to the United States. His detention in Thailand was to expire within days. 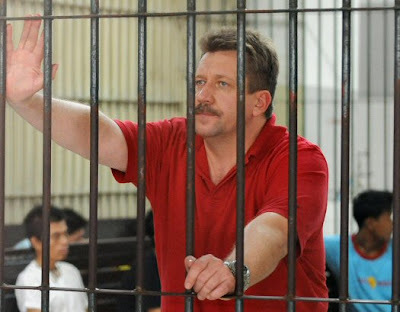 Thailand Extradites Russian Arms Dealer Viktor Bout to U.S.
Viktor Bout, in Thailand prison in July 2008. Thailand extradited Viktor Bout to the U.S. to face terrorism charges, ending two years of legal wrangling over the accused Russian arms dealer dubbed the "merchant of death." Bout left Bangkok's Don Muang airport on a 14-seat U.S. jet at 1:27 p.m. local time, said Supisarn Phakdinarinath, a Metropolitan Police spokesman. The extradition was approved by Thailand's Cabinet today, Prime Minister Abhisit Vejjajiva said. The U.S. says Bout, a former Soviet air force officer, ran an air cargo network that shipped weapons to conflict zones from Afghanistan to Rwanda. Bout has repeatedly denied wrongdoing, saying he was framed by U.S. undercover agents who posed as Colombian rebels during his arrest in Bangkok two years ago. Bout is charged in the U.S. with conspiracy to kill U.S. nationals, conspiracy to kill U.S. officers or employees, conspiracy to acquire an anti-aircraft missile and conspiracy to provide material support to a designated foreign terrorist group. If convicted, he may face life in prison. Bout's case has fueled a diplomatic dispute between the U.S. and Russia, with each country pressuring Thailand to follow its version of events. Russia's financial watchdog is looking into the activities of its banks and other financial institutions for possible involvement in hacker attacks in the United States, the head of the agency said on Tuesday. "We are working together with the Americans. The question we are looking at is whether our Russian financial institutions could have been involved in these [money laundering and hacking] operations," Yury Chikhankin, head of the Russian Financial Monitoring Service, said at a meeting with Prime Minister Vladimir Putin. In mid-October, a U.S. court found two Russians, 25-year-old Dmitry Krivosheyev and 24-year-old Maxim Illarionov, guilty of staging a cyber attack on banks and stealing their money. Krivosheyev and Illarionov were two members of the group behind a scam to penetrate companies' computer networks, steal their bank details and siphon off cash. Their partners in crime have yet to be identified. In total, the gang fraudulently transferred about $1.3 million from their victims' bank accounts.